Happy Death Day is a 2017 American black comedy slasher film directed by Christopher Landon, and written by Scott Lobdell. It stars Jessica Rothe, Israel Broussard, and Ruby Modine. The film was produced by Jason Blum through his Blumhouse Productions banner. The film is also in association with Digital Riot Media and Vesuvius Productions. It follows a college student who is murdered on her birthday and begins reliving the day repeatedly, at which point she sets out to find the killer and stop her death. Originally announced in 2007 under the title Half to Death, the film was released on October 13, 2017, by Universal Pictures. It grossed $125 million worldwide on a $4.8 million budget and received generally positive reviews, with critics deeming the film entertaining while acknowledging the familiar premise, and describing it as "Groundhog Day meets Scream". A sequel, Happy Death Day 2U, was released on February 13, 2019. Originally announced in 2007 under the title Half to Death, the film was released on October 13, 2017, by Universal Pictures. It grossed $125 million worldwide on a $4.8 million budget and received generally positive reviews, with critics deeming the film entertaining while acknowledging the familiar premise, and describing it as "Groundhog Day meets Scream". 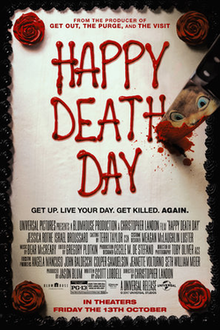 A sequel, Happy Death Day 2U, was released on February 13, 2019. Waking up, Tree explains the events to Carter. He suggests taking advantage of the loop to identify her killer. She spends the next several iterations trailing people she considers suspects but is killed each time. After waking from a loop where she is bludgeoned, Tree faints and awakens in the campus hospital. Her body shows evidence of recovery from multiple traumatic injuries, indicating she has retained physical damage from her previous deaths. After escaping the hospital, Tree is pursued and killed again. Back in Carter’s bed, Tree convinces him of her predicament by demonstrating her knowledge of the day's events. Tree admits to harboring tremendous self-loathing, particularly from pushing away her father after the death of her mother years ago. Tree sees a local news report on John Tombs, a serial killer being held at the campus hospital. Concluding that Tombs is her killer, Tree rushes to the hospital to warn of his escape. Tombs breaks free and nearly kills Tree, but Carter follows and rescues her. Tombs kills Carter before chasing Tree to a nearby bell tower, where she subdues him with a crowbar. Realizing that Carter will remain dead if she ends the loop, Tree hangs herself. Tree wakes up still in the loop; angry and confused, she returns to her room, where Lori offers her the cupcake again. Tree realizes the previous loop was the only time she had ever eaten the cupcake, and had died in her sleep. Tree realizes Lori is the true killer. Lori had poisoned the cupcake, but when Tree failed to eat it, Lori utilized her job as a nurse at the hospital to frame Tombs for Tree's murder. Tree announces she will take the cupcake to the police, but Lori attacks Tree. She admits to also having an affair with Dr. Butler, whose preference for Tree drove Lori mad with jealousy. In the ensuing fight, Tree stuffs the poisoned cupcake in Lori's mouth, then kicks her through a window to her death. The film was released on digital HD on January 2, 2018, and was released on DVD and Blu-Ray on January 16, 2018. The home release features the original ending. 1 2 3 "Happy Death Day (2017)". Box Office Mojo. Retrieved December 9, 2017. ↑ Miska, Brad (April 20, 2017). "Get Scared 'Half to Death' This October". Bloody Disgusting. Retrieved April 20, 2017. 1 2 Giles, Jeff (October 12, 2017). "Happy Death Day Is Familiar but Fun". Rotten Tomatoes. Retrieved October 13, 2017. 1 2 3 D'Alessandro, Anthony. "Blumhouse Has Plenty To Smile About As 'Happy Death Day' Scares Up $26M+ Opening". Deadline Hollywood. Retrieved October 15, 2017. 1 2 3 "How it took nearly 10 years to make the horror movie 'Happy Death Day'". October 4, 2017. ↑ "EXCLUSIVE: Megan Fox Joins Half to Death". Beyond Hollywood. July 15, 2007. Archived from the original on September 28, 2017. Retrieved September 27, 2017. ↑ McNary, Dave (October 11, 2016). "Jessica Rothe Starring in Horror Movie 'Half to Death'". Variety. Retrieved April 20, 2017. ↑ McNary, Dave (November 8, 2016). "Ruby Modine Joins Horror Movie 'Half to Death'". Variety. Retrieved April 20, 2017. 1 2 "THE STORY BEHIND 'HAPPY DEATH DAYS CREEPY BABY MASK AND TREE'S BEST LINES". October 12, 2017. Retrieved October 17, 2017. ↑ "Happy Death Day Influences: 10 Movies That Inspired the Director". 1 2 "'Happy Death Day' Ending: Director Shares Sequel Plans for Part 2". The Hollywood Reporter. October 15, 2017. ↑ "Happy Death Day's Jessica Rothe On What It Means To Be A Scream Queen in 2017". ↑ Philip, Tom (October 18, 2017). "Happy Death Day Star Jessica Rothe Explains What It's Like to Die a Dozen Times in the Same Movie". GQ. Retrieved October 19, 2017. ↑ "Happy Death Day Shot An Original Ending That Made Test Audiences Furious". Cinema Blend. October 16, 2017. Retrieved January 21, 2018. ↑ "Happy Death Day (Original Motion Picture Soundtrack) [Bonus Track Version]". iTunes Store. October 13, 2018. Retrieved February 16, 2018. ↑ "'Happy Death Day' expected to unseat 'Blade Runner 2049' at the box office". Los Angeles Times. October 11, 2017. Retrieved October 11, 2017. ↑ "Blumhouse Makes a Wish for Another #1 Opener with 'Happy Death Day'". Box Office Mojo. October 12, 2017. Retrieved October 13, 2017. ↑ D'Alessandro, Anthony. "'Boo 2! A Madea Halloween' Reaps $21M+ During October Dumping Ground At The B.O." Deadline Hollywood. Retrieved October 22, 2017. ↑ "Happy Death Day (2017)". Rotten Tomatoes. Fandango Media. Retrieved February 20, 2019. ↑ "Happy Death Day Reviews". Metacritic. CBS Interactive. Retrieved October 21, 2017. ↑ Robey, Tim (October 19, 2017). "Happy Death Day review: slasher Groundhog Day gives us a scream queen for the ages". The Telegraph. ISSN 0307-1235. Retrieved October 20, 2017. ↑ "Like a slasher Mean Girls, Happy Death Day nails comedy and horror". The Sun. October 19, 2017. Retrieved October 20, 2017. ↑ "Happy Death Day Review". Screen Rant. October 13, 2017. Retrieved October 20, 2017. ↑ Acuna, Kirsten (October 1, 2017). "'Happy Death Day' isn't out yet, but the director already has an idea for a sequel". Business Insider. Retrieved October 22, 2017. ↑ "'Happy Death Day' Sequel Reportedly Filming This Summer". March 16, 2018. Retrieved March 18, 2018. ↑ "'Happy Death Day 2': Jessica Rothe, Israel Broussard Return; Suraj Sharma & Sarah Yarkin Joining Blumhouse Sequel". Deadline. Retrieved May 1, 2018.